Gleeful anticipation. That was what I felt when I heard that the new Movida Bakery (3 Tivoli Road, South Yarra) was set to open in my 'hood. As a ravenous food blogger, having a Movida outlet in my suburb is like winning a hot dinner date with a celebrity. The nice thing about getting to know a celebrity better with a few more dates, though, is that this blog post, written over a month later, is considerably less fan-girly, and more rational and measured. Gladly, even though the initial starry-eyed excitement is over, this is a largely positive relationship and one that I am happy to keep going for as long as it remains warm, convenient and delicious. My first purchases? The much-hyped doughnuts. They kept me in good company as I awaited my friend Leon to arrive, reliably late, for our catch-up brunch. The salted caramel has been getting a lot of attention in the press. 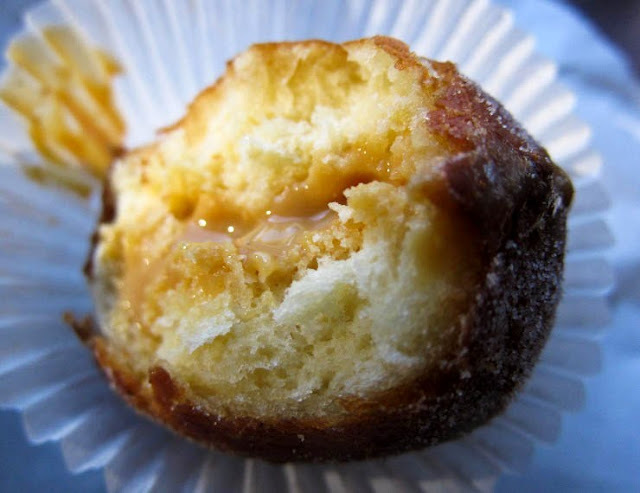 This is a doughnut for those with a sweet tooth - check out that rich, glossy caramel. The very popular salted caramel doughnut ($3.5). I've always tended more towards lighter, fruitier treats rather than rich ones, though, for the most part, so I was keen to try the others. 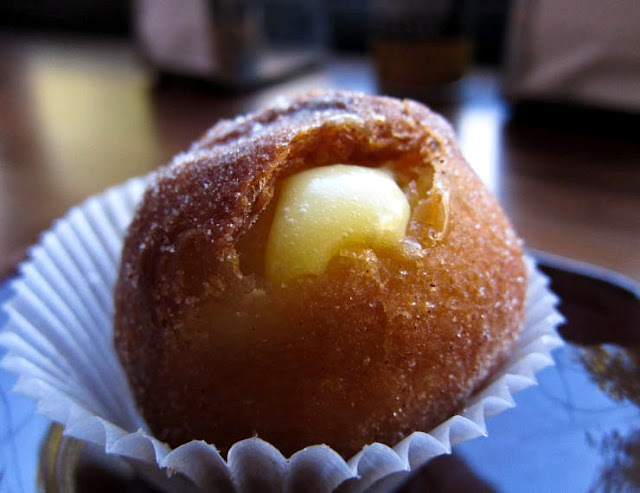 So here we have the lemon doughnut, with a very, very lemony curd filling for those who like a robust sour hit. The boldly tangy lemon doughnut ($3.5). The rhubarb doughnut has a graceful acidity in the curd and just the right amount of sugar for me. At this point in time, it's probably my favourite, though my cravings do change depending on my mood. The rather charming rhubarb doughnut ($3.5). As a side note, while the doughnuts are tasty, at $3.50 a pop I don't see myself buying them often. Also, I'd like to see them kept in a warmer so you're not at the mercy of lucky timing to get a piping hot one. Because we all know a good doughnut is always a hundred times better when it's at that perfectly snug 'n' toasty temperature. Lamb pie (I think it was around $6.5). 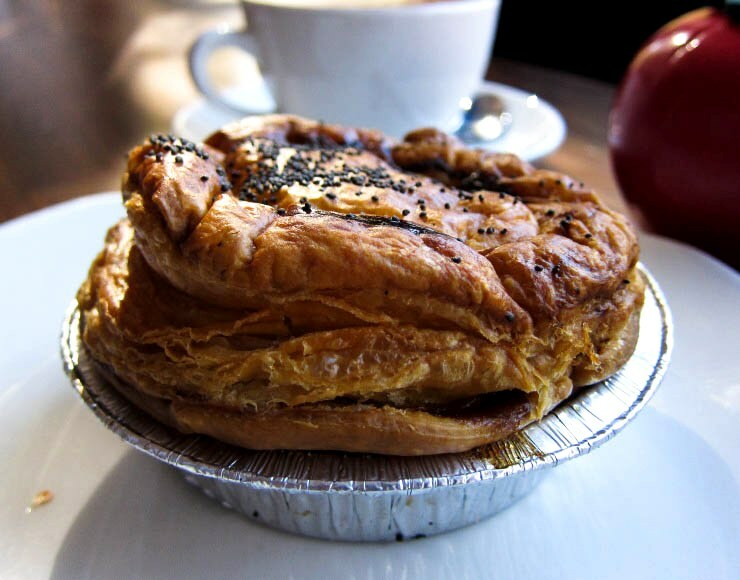 Leon went for the PX beef pie, which had a billowing pastry that was quite a sight to behold. I was offered a bite, which culminated in a silky, luxurious filling, dark and exotic with hints of Pedro Ximenez sherry and star anise. We both agreed that we preferred this pie. PX beef pie (I think it was around $6.5). I've returned by myself a couple of times since that first visit. 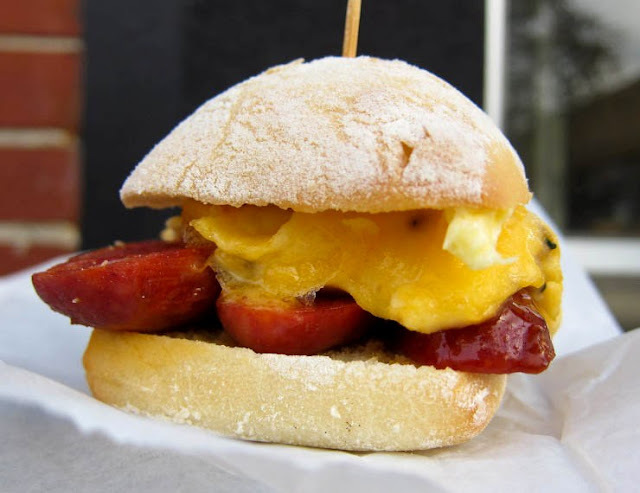 A recent favourite is the egg and chorizo mini sandwich. The simple pairing of delicately herbed and seasoned scrambled egg with the gorgeous smokiness of the chorizo made my tram ride to work so much more fulfilling. This egg and chorizo mini sandwich ($5) lifts my spirits in the morning. 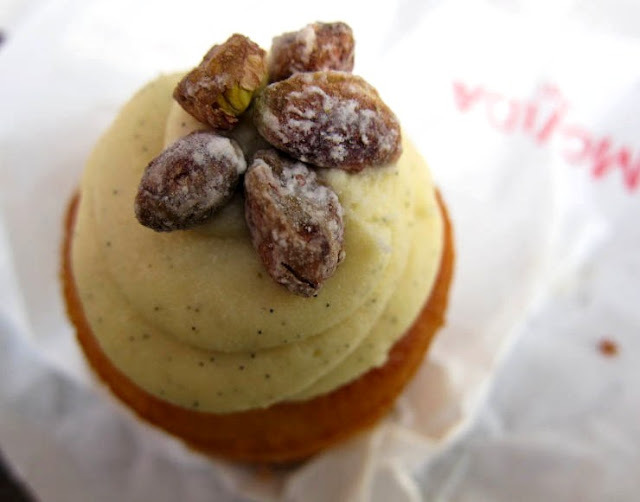 Also winning my heart is this flourless almond orange cake with vanilla-flecked buttercream and candied pistachios. A lovely moist crumb, just the right amount of zestiness, and that lush topping... I don't know if it's a regular item on the menu, but I hope we meet again. Orange cake ($5), flourlessly beautiful. In any case, Movida Bakery is a great addition to South Yarra - despite the star status of the Movida name, it exudes neighbourly charm and the gunny sacks of organic flour that compose part of their decor make me feel a little less guilty about all the carbs I'm consuming. I look forward to trying more of their goodies in the ensuing months. Those doughnuts look impressive. I'm not generally a fan of doughnuts, but I sometimes like to make them at home. They always look sort of similar to these, but I've never put filling in mine. Rhubarb - whoa! Do you think they pipe the filling in afterwards? That beef pie. Ooh, and that sandwich. Hunger. Yeah, it certainly looks like they're piped in afterwards. That seems to be the usual way. You have made me so hungry! This stuff looks just great. No wonder you got fan-girly! I want all of these, even the tomato container for the sauce. We used to have when growing up and I'd love to have one. Going to search now . . . I don't know if it's as big as Bourke Street Bakery, but yeah, really nice to have Movida Bakery here. I like how they experiment and indulge us with off-the-menu surprises too. I imagine it makes their days more exciting as well! oh my God, lemon curd donuts??? I dont venture over that side much but I tell you what....my two favourite things! God I want doughnuts now! Haha I know what you mean by fan-girly vs rational and measured. Good that you've been there a number of times by now, and I like how you prefer the lighter and fruitier offerings as opposed to the really sweet rich offerings. I now know what I want when I visit. Actually, I wanna (and STILL haven't) visit all 3 sweet places near your place, B&P, Luxbite & now this! Ha, yes, the return visits are inevitable here which is good - nice to know a place better before collecting my thoughts about it. Still many things to try, though! Oh and I haven't been to B&P and Luxbite in a while, wouldn't mind going again! That is some INCREDIBLE pastry on the pie. Phwoar. I have to confess I've been showing off that picture to people quite enthusiastically... it does look impressive! ooh, so it is part of the movida franchise! 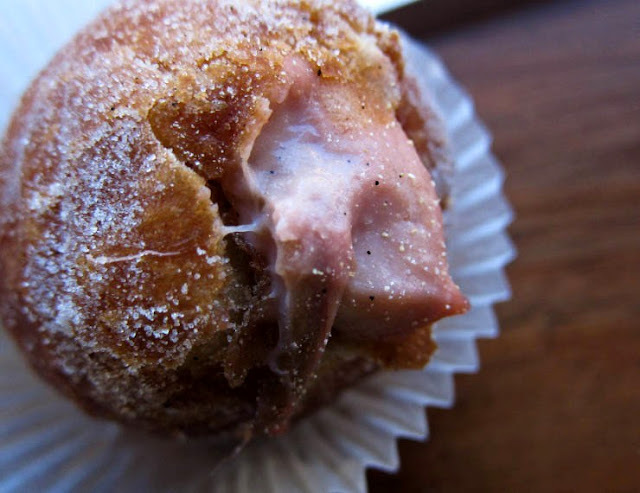 rhubarb curd filled doughnut! I think the worlds a little better for the existence of such joy! The doughnuts look amazing... however - $3.50 each? Ouch! I can vouch that a chorizo and egg sandwich is indeed a fabulous start to the day! Yum - I wish I had those doughnuts in front of me now - they look way too sinfully delicious! We went to Movida Aqui for the first time during our recent trip to Melbourne and I really liked the elegant tapas there. I didn't realise they have a bakery. 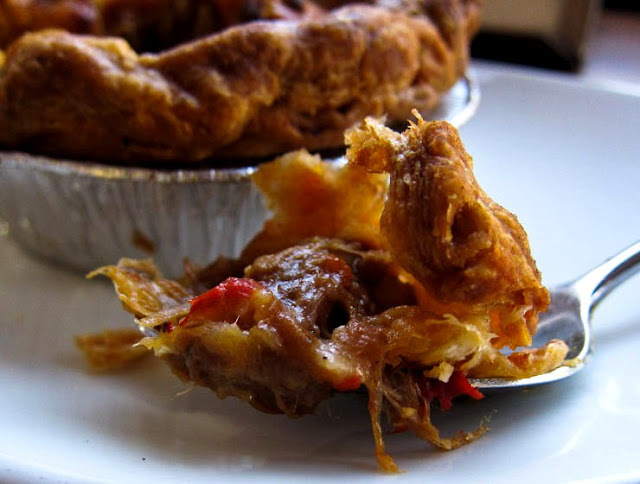 That beef pie looks pretty hearty too. Oh, my...! You are torturing me here. Those donuts...? It is almost midnight here and it is bad idea to even think about them. You've literally got me drooling. Those pies look very tasty in the photographs (I'm not a sweet tooth either). This post is going to kill my Winter health kick I can tell. oh I SO want to go here. Great review. yum! Oh my goodness... salted caramel... the mere sound of that has me melting to pieces! I just had breakfast but seeing these tantalizing photos, I'm quite certain I could make room for more :). Ah! I really need to go here... Soon!! Would like to read your thoughts on it when you do! Fascinating, thanks for sharing this! oooh Dear Lord in Heaven this looks absolutely fantastic. You have my (culinary) mind going crazy over those. Thanks for the share! Will have to pop by now that I'm back!